EAA’s 2018 Bridge Showcase and Awards Event was held on Saturday, May 5th at the PG&E Auditorium in San Francisco, marking the 18th straight Student Impact Project with exceptional participation by students, volunteer engineers, teachers and dedicated donors. 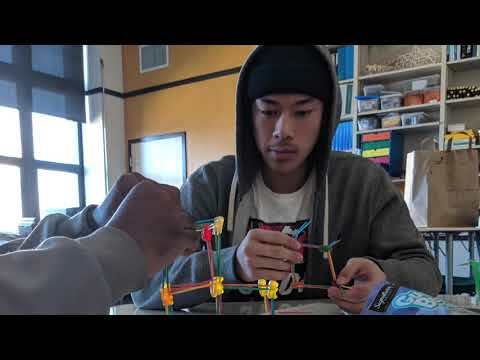 Participating high school students spent nine weeks developing bridge designs for a new traffic bridge at Benito Juarez International Airport, Mexico City, Distrito Federal, MEXICO, OR the replacement traffic bridge for Pfeiffer Canyon, Big Sur, California, USA. Over 90 student teams from six San Francisco, four East Bay, one peninsula and one Napa Valley high schools participated in EAA’s in-class program. 23 Bay Area firms provided 51 volunteer structural engineers and architects to teach the weekly curriculum. A welcome address by PG&E Vice President and EAA Advisory Board Member Barry Anderson kicked off the afternoon program. This year, a new category was added to the Awards Event. The Founder’s Award was presented to two bridges displaying exceptional creativity and awarded to the winning teams by EAA Founder Ashraf Habibullah. Every student on a winning team received a trophy. The awards and the program were made possible by the generous support of our donors. Clifton Goff, Kiewit Engineering Group Inc.
A total of 91 teams from 15 high school classes in San Francisco, the East Bay, Napa Valley and Peninsula participated in this year’s SIP. Each school held its own preliminary competition to select the top bridges in each class to participate in the Bridge Showcase and Awards Event. Watch the 2018 Memorable Moments video of students from all participating schools at work in the classroom. Click here to see what it is like to be at the Awards Event and present a bridge to our panel of judges.